The complex between ribonuclease and ribonuclease inhibitor is one of the tightest known intermolecular interactions, but researchers at the CESG are trying to change that. Ribonuclease is a small but destructive enzyme that is secreted by the pancreas and used to chew up RNA in our diet. Occasionally, however, it finds its way inside cells where it can wreak havoc on our cellular RNA molecules. To protect against this, our cells build a specific inhibitor protein that fights rogue ribonuclease molecules one-on-one. The structure solved by researchers at CESG (PDB entry 1z7x) shows how the human form of ribonuclease inhibitor works. 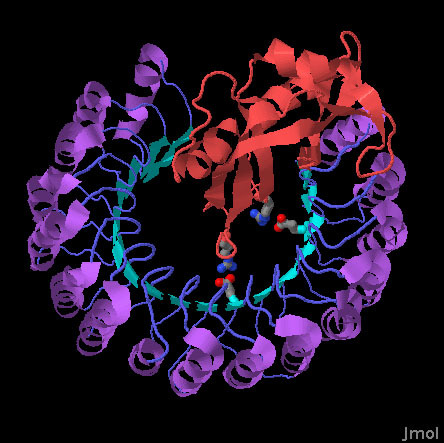 As with the similar inhibitors from other organisms, human ribonuclease inhibitor (shown in blue) is a horseshoe-shaped protein that surrounds ribonuclease (shown in red) and blocks its active site. The strong binding is due in part to the large area of contact between the two proteins, and is augmented by strong electrostatic interactions. In mutagenesis studies, two amino acids in particular have been implicated: arginine 39 and arginine 91. In the complex, these form tight salt bridges with two glutamate amino acids in the inhibitor. These charged amino acids may also act as "electrostatic steering residues" that guide ribonuclease to its proper binding site on the inhibitor. 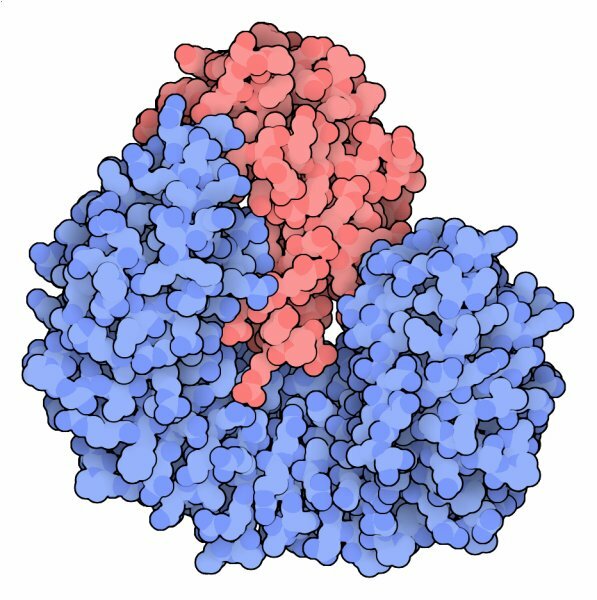 The tight binding of ribonuclease with its inhibitor is a great advantage to the cell, since it effectively detoxifies the ribonuclease. In some cases, however, this is not the result that we want. Ribonuclease is toxic to cancer cells and is being tested as a possible therapy. Cancer cells, however, contain the inhibitor and quickly inactivate ribonuclease before it has a chance to kill the cell. Researchers have tried two approaches to solve this problem. First, they have tried using ribonucleases from other organisms, which are structurally different than our own ribonuclease and not strongly blocked by the inhibitor. However, they can also cause side effects because they are foreign to the human body. An alternate approach is to change the human ribonuclease enough to block its interaction with the inhibitor. Based on the CESG crystal structure, researchers mutated the two "steering" arginine amino acids in ribonuclease, changing them to oppositely-charged aspartates. This resulted in an enzyme that is still active in the RNA-cleavage reaction, but which binds weakly to the inhibitor. Ribonuclease inhibitor is a horseshoe-shaped protein that is composed of a series of repeated helix-sheet modules. Ribonuclease (shown in red) binds inside the horseshoe. Use the buttons below to look at the two steering arginine amino acids and their interaction with aspartates on the inhibitor. R. J. Johnson, J. G. McCoy, C. A. Bingman, G. N. Phillips and R. T. Raines (2007) Inhibition of human pancreatic ribonuclease by the human ribonuclease inhibitor protein. Journal of Molecular Biology 368, 434-449. K. A. Dickson, M. C. Haigis and R. T. Raines (2005) Ribonuclease inhibitor: structure and function. Progress in Nucleic Acids Research and Molecular Biology 80, 349-374.